The miscommunications centered on the course setup crew’s placement of the turnaround on what Stewart called a “working mark” that was 120 feet north of the actual turning point on Ohio Drive SW in West Potomac Park. 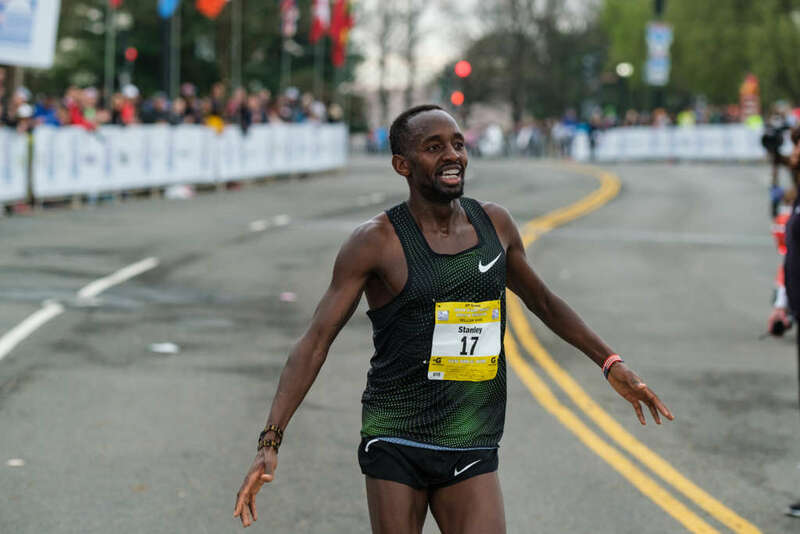 His 46:00 for 9.96 miles averages to 4:36 per mile, which, when extrapolated over the remaining 240 feet, would have put Kebeini right at 46:13. Wanjiru’s 50:42 extrapolates to 50:54 well ahead of Tebya Erkesso’s 51:44 10 mile record in a women-only race in the United States. 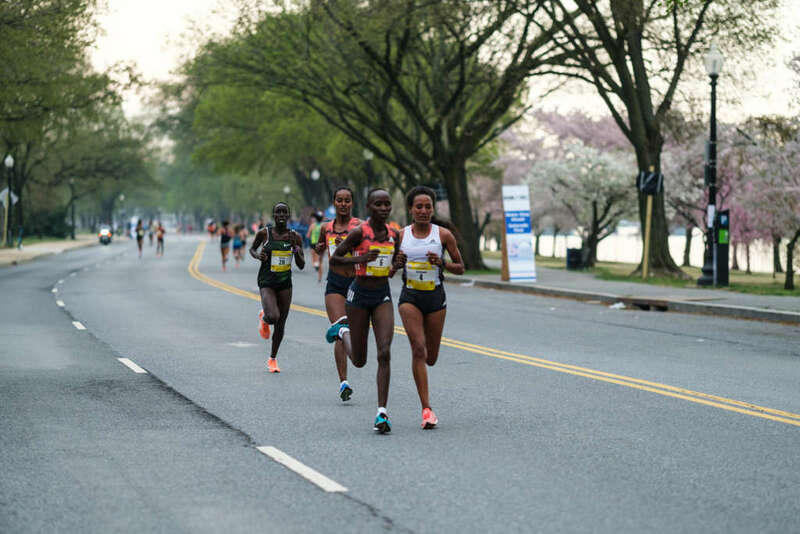 Cherry Blossom will still pay Kebanei $10,000 for a record bonus and $1,000 and $750 respectively to Wanjiru and Gotytom Gebreslase for being the first two finishers under 52:00 and Jemal Yimer and Josphat Tanui likewise for breaking 46:00. Emma Bates (52:18) narrowly missing seeming to break Janet Bawcom’s 52:12 American record on Sunday. Stewart had heard questions about the length of the course after runners reported getting GPS readings closer the 10.00 miles than usual, given the difficultly of running perfect tangents. “It’s very unusual to have GPS data that’s right on the race distance,” he said. Still, runners like Arlington’s Clint McKelvey noted that manual splits were fast for mile four. McKelvey’s split of 4:39 (his 49:45 finish would have put him at 4:58 pace for 10 full miles) showed his third manual split being 0.94 miles. 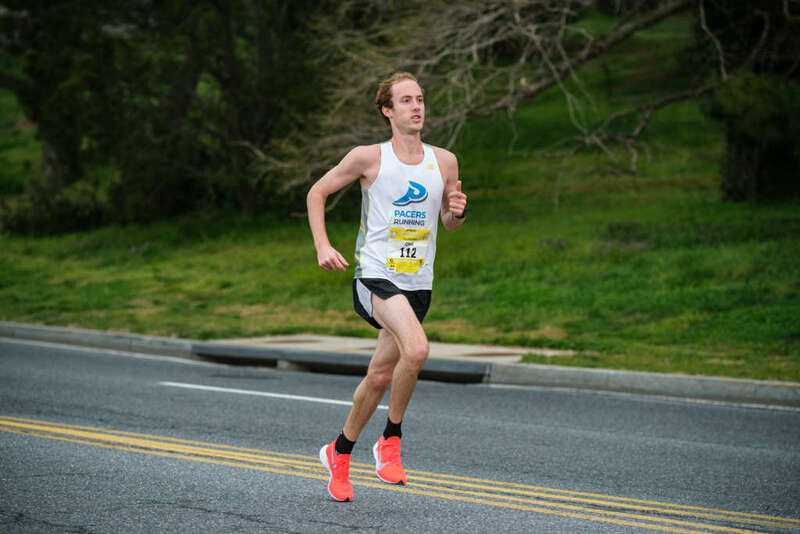 Stewart had decided to move intermediate timing mats to 5k, 10k and 15k to give runners more useful data, and found consistently faster middle-5k splits for the top 10 runners in men’s and women’s races, with a few outliers, like Yimer, who ran a faster third 5k than second (13:39 versus 13:45). On Wednesday afternoon, Stewart biked to West Potomac Park from Bethesda and saw the two marks and knew where the race crew had gone wrong. Stewart had issued apologies earlier in the week for delays with race-day baggage claim and a shortage of medals immediately following the race.